Looking for plates? If so, you have come to the right place! The dinnerware section of the fine dining category is dedicated to plates. Not only do we offer an array of different styles of plates, but we also offer themed plates, which are perfect for adding style to any place setting at your dinner table. When choosing plates, it is very important to consider how the plate will be used. We carry salad plates and canape, or appetizer plates, as well as more traditional dinner plates and chargers. We do not only offer plates but soup bowls as well, ensuring that we have all the dinnerware you need to create a full spread. All of our plates are made of quality materials, and many are made in elegant porcelain and fine stoneware. Some feature unique twists like pewter medallion accents, while others are a bit more stylized, like solid pewter chargers or glass plates shaped like veined leaves. Whether you need something traditional or striking, you can bet that you can find the personal plate or soup bowl that you need for your dining experience here in our dinnerware section. An artistic, intriguing medallion embellishes the top rim of this hand-glazed, twice-fired Medici stoneware plate. 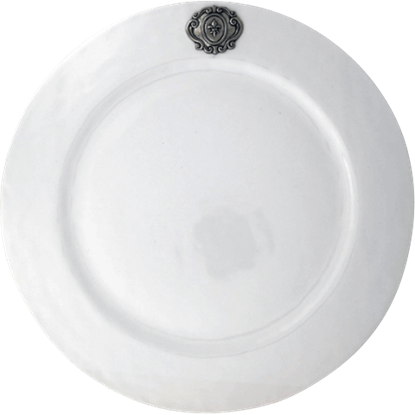 The Medici Canape Plate is luminously white to provide the perfect canvas for your artisan amuse-bouches. 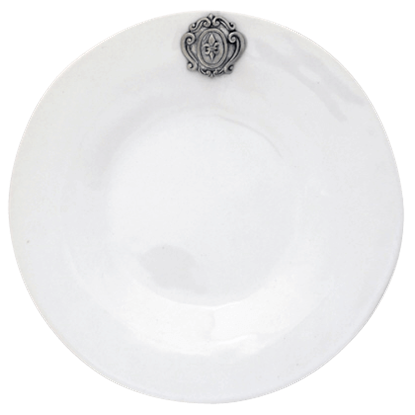 Simple and elegant, the Medici Fiore Charger Plate is the perfect plate for formal, full course dinners. Crafted from high quality, twice-fired stoneware, this plate shows off minimalistic charm in its lovely design. An artistic, intriguing medallion embellishes the top rim of this hand-glazed, twice-fired Medici stoneware plate. 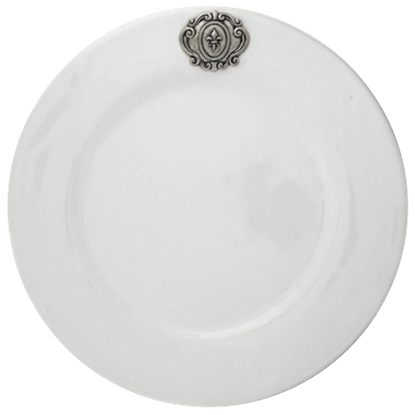 Luminously white, the Medici Charger Plate makes a perfect starting point for your carefully planned table settings. An artistic, intriguing medallion embellishes the top rim of this hand-glazed, twice-fired Medici stoneware plate. 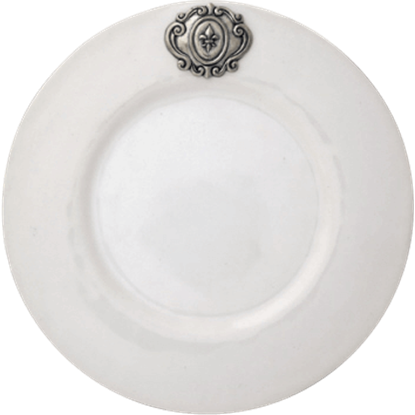 The Medici Dinner Plate is luminously white to provide an elegant backdrop for your exquisitely prepared fare. An artistic, intriguing medallion embellishes the top rim of this hand-glazed, twice-fired Medici stoneware plate. The Medici Salad Plate is luminously white to provide an elegant backdrop for your colorful, creative salads. An artistic, intriguing medallion embellishes the top rim of this hand-glazed, twice-fired Medici stoneware bowl. The Medici Soup Bowl is luminously white to provide an elegant backdrop for your favorite soups and stews. 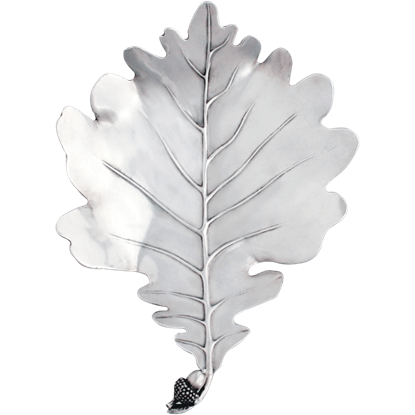 Serve your guests with natural elegance when you add the Pewter White Oak Leaf Plate to your table setting. 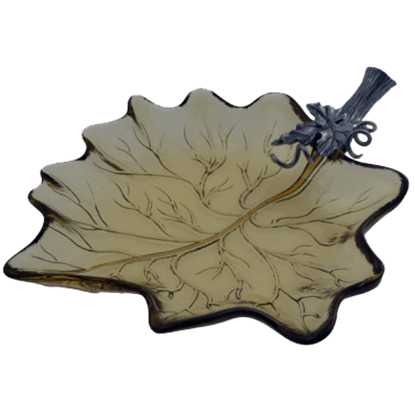 You can present delicacies on this fine, nature-inspired plate that is modeled to look like a large leaf from the white oak. 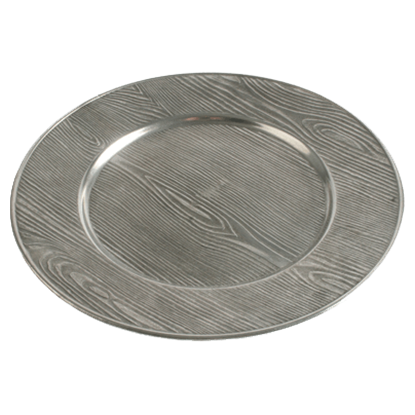 Intricately detailed with a faux wood grain, the Pewter Wood Grain Charger Plate brings classic colonial style and modern elegance to your table. This large, grey underplate features a wide rim around the edge.